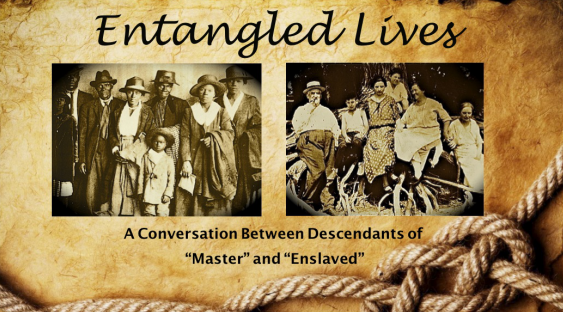 Entangled Lives: A Conversation Between Descendants of “Master” and "Enslaved" is an ever-evolving dialogue and slide presentation appropriate for schools, community organizations, and faith groups created by Ann Neel and Pam Smith. We met and became friends over 20 years ago through a mutual passion for family history research. After making the shocking discovery that one of Ann’s ancestors had owned one of Pam’s ancestors in slaveholding Missouri, we created this presentation as a way to deal with the painful legacies that the long history of slavery and Jim Crow have left all of us. We have found that facing this past -- rooting ourselves in the concrete histories of our respective families and communities, and talking openly about them -- is personally transforming and mutually healing. With slides and lively commentary, Entangled Lives shows how our family histories are but particular versions of this country’s tragic interracial history as a whole. With each new discovery we have learned more about how deeply our family histories are embedded in the massive migration of white and black families across the North American continent from the Atlantic to the Pacific. A major aspect of this epic interracial migration involved the subordination of people of color through force, law, and a culture of white supremacy. In seeking to understand the consequences and implications of slavery and Jim Crow segregation for our lives today, Entangled Lives moves back and forth between the lives of our ancestral generations and those of the more recent past. We use family pictures, official records, (such as US censuses of population and slaveholding, marriage, probate, and other documents), as well as photographs from research trips, to illustrate and document our stories. In the process of linking our stories, the old wounds of “race” could not help but rise to the surface. Our presentation includes discussion of our frustrations and struggles with each other related in large part to the legacies we have each inherited. (e.g. see Poetry section). to show how racial reconciliation and genuine friendship in the present become possible among people whose ancestors stood on opposing sides of an interracial/interethnic conflict -- when honest communication about the struggles and pain of the past is accompanied by large doses of care, tenacity, courage, and humor.